With the Chancellor adding another couple of pence to the price of a pint, those who enjoy a tipple might well think of making their own booze. For those who decide to go for it, Andy Hamilton’s Booze for Free is a highly useful read. 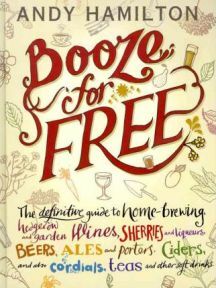 Far more than a practical guide to how to brew at home, this book offers countless inspiring recipes using free or inexpensive ingredients to make beers, spirits, ciders and cordials (and more) in much less time than one might expect. Follow these tried and tested recipes, presented with clarity, and you’ll have beer within two weeks; if you can’t wait that long, you might prefer to try your luck with horseradish vodka which will be ready in a couple of days. This book should get even the most jaded drinker out of the armchair and into the countryside. Hamilton provides plenty of tips for would be foragers, highlighting the wealth of treasures in our hedgerows, woods and fields. As well as outlining the uses of these various plants and giving advice on how to prepare and use them, Hamilton provides plenty of historical and botanical detail which makes this an on trend genre busting read. For me the only thing missing was some illustrations that might give me a better idea of how to recognise some of the more unusual plants. Booze for Free embraces a lifestyle, or at least an attitude that is becoming more common; Hamilton writes wonderfully about the countryside and he imparts much of the pleasure that can be derived from sourcing the ingredients and making something yourself. He throws in a few drinking tales and lots of personal experience of using these recipes. So far I’ve tried and tasted only recipes for teas and cordials but if they results are as successful, then graduating to beer making is certainly something to look forward to. While you do need to prepare yourself with the right equipment (there’s nothing hugely specialist or expensive to find) before you start, these projects are accessible manageable even for people with little or no experience of brewing and certainly less complicated than some of those homebrew packs sold in the shops. Our rosemary infused wine will be ready soon and I’m awaiting feedback on the lavender cordial I recommended to friends who are in the process of setting up their own lavender farm. Homemade crème de menthe is ear-marked for a forthcoming party and eagerly anticipated. I’m not convinced about all of the suggested recipes – despite being a Marmite aficionado I can’t find any enthusiasm for marmite wine – but overall this is an eclectic and exciting selection. What is so great about this book is that the recipes can stand adaptation. Andy Hamilton’s ideas really fire the imagination and his enthusiasm is infectious. These recipes are easy to adapt and variations are given for many of the recipes. Besides, once you know the basic techniques for getting the best from the ingredients, you can experiment with your own flavour combinations. Tips on growing your own produce for use in these drinks are an invaluable inclusion and are given with Hamilton’s usual clarity and brevity without leaving any annoying unanswered questions. There’s no assumption that readers are fully versed in the art of brewing. There’s a comprehensive resource listing places around the country where brewing supplies and equipment can be purchased and a glossary of brewing terms that beats any I’ve read in more specialist tomes. Booze for Free is one of those books you can pick up and dip into randomly; you can enjoy it without necessarily intending to make any of the recipes yourself but I’d challenge anyone not to be persuaded by Hamilton’s enthusiasm. It’s required reading for home brewers and it would make a great gift for anyone interested in sustainable living and nature. Some of Hamilton’s recipes have appeared in the Guardian but it’s great to have this really comprehensive collection in one volume. It really is one of the most exciting and inspiring non-fiction reads I’ve found in ages. No Comments on "Booze for Free"